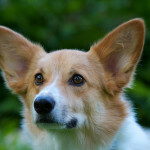 Often known as Corgeagle or the Beagi, the Corgi Beagle mix is a designer breed that is a mix between a Welsh Corgi and a Beagle. These are small dogs that generally live a long life, and they tend to be lively, alert, and very social. If you’re looking for a small, mixed breed dog, these dogs may be a great choice for you. However, you’ll want to learn more about their history, temperament, appearance, grooming needs, and potential health problems before you make your final decision. The Corgi Beaglemix is a designer dog that has an unknown history. While it’s likely that the hybrid was created within the past 20-30 years, it’s unknown when exactly the mix was first started. No one is quite sure why or where the designer dog got its start. Although the origins of the Corgi Beagle mix are unclear, you can look at the origins of the Beagle and the Welsh Corgi to learn more about the Beagi. Beagle-like dogs were seen all the way back in Roman times, although the Beagle we’re familiar with today has a more muddled history. You don’t begin to see the modern-day Beagle until about the middle of the 1800s, which is when these dogs were bred for hunting. Once the Beagle was brought to the United States, southern hunters bred these dogs to be smaller and used them for hunting purposes, often in packs. Today Beagles are still used as hunting dogs and some are cherished family pets and companions as well. The Welsh Corgi comes in two varieties: the Cardigan and the Pembroke. They are very similar, but usually the Cardigan is a bit bigger and has a longer tail. The Cardigan is also the older of the two varieties and it’s thought that the Cardigan was used in Wales for thousands of years to be a cherished pet and to help drive cattle. The Cardigan can be a bit territorial, but they are very trainable and intelligent. The Pembroke Welsh Corgi was bred to work on farms as well, and it’s thought that these dogs have origins that go back to the time of the Vikings. It was the Pembroke that was very popular with Queen Elizabeth II. The Corgi Beagle mix is very small and usually only weighs between 10 and 20 pounds. They usually have a short, longer body and generally have the long, floppy ears of a Beagle. Most have a rounded heat, a long curled tail, and beautiful round, brown eyes. Their coat is a double coat that is soft on top and thick and short underneath. The coat is waterproof and comes in multiple colors, such as tricolor, sable, white, red, tan, black, orange, yellow, and fawn. You can expect the Corgi Beagle mix to be very lively and energetic, and while they are very friendly and fun, they often have an independent streak as well. These dogs are protective and alert, and they’re often a bit wary with strangers. Sometimes they are territorial, and if they are in unknown locations or around people they don’t know, they may act very protective. The Beagi is eager to please and very smart, and they are loyal, loving pets that like to show their affection. The Corgi Beagle mix loves to be the center of attention and will enjoy being included in all family activities. Since they enjoy being around people, they don’t do well if they’re left alone for a long time. It’s important to make sure your Corgi Beagle mix gets plenty of exercise. While they can do fine in small apartments, they still need play time, walks, and mental and physical activity. They love heading to the dog park, they often love swimming, and they’ll enjoy playing games like fetch as well. Some games, playtime with toys, and a couple walks a day should keep your Corgi Beagle mix happy and healthy. Since the Corgi Beagle mix does like to please and is intelligent, they usually do well with training, although they can be a bit stubborn from time to time. The Beagi needs a firm hand when training, but it’s essential to only use positive training methods, such as rewards, treats, and praise. It’s essential to begin training and socialization as early as possible for the best results. The Corgi Beagle mix is a moderate shedder and will require a moderate amount of maintenance. It’s a good idea to brush these dogs every other day to keep shedding to a minimum in the house. Only bathe the Beagi as needed and make sure you use a shampoo specifically designed for dogs. Ears need to be checked and wiped weekly with an ear cleanser designed for dogs. They also need to have their teeth brushed several times a week. When nails need trimmed, you may want to leave this to a professional groomer. While the Corgi Beagle mix may have talents in agility, tracking, and being a good watch dog, they usually are used as family or companion dogs. Have a Corgi-Beagle mix getting on in years. The mother was a Beagle and father was a Corgi. Been a great dog. Looking to see if anyone has or knows where can find puppies of this mix type. Can anyone point us in the right direction.